New cars typically contain more than one hundred MCUs throughout the automotive platform. Engine control, body and chassis control, EV/HEV battery management, instrument clusters, on-board diagnostics and other functional safety applications continue to expand the requirements for automotive MCUs. In addition, the growth of non-optical and image sensors that monitor engine performance, stabilization, and climate control are driving the addition of sensor fusion capabilities to the MCUs. 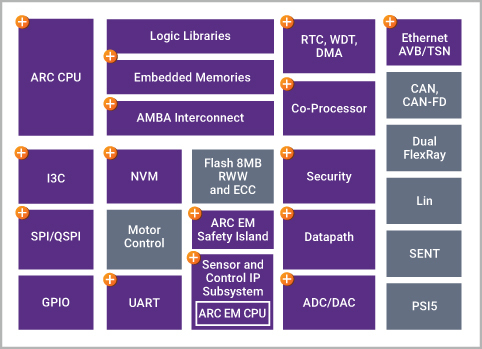 Synopsys offers the industry’s broadest portfolio of interface IP, data converters IP, high-performance datapath elements, embedded memories and logic libraries, security IP, and 32-bit ARC® processors and subsystems for mainstream automotive MCUs. Security IP for cryptography and protocol acceleration including secure boot, secure remote lifecycle management and secure instruction and data controllers. MIPI I3C controller IP, compliant with the latest MIPI I3C specification supports all data rates up to 33.4 Mbps with in-band interrupts within the 2-wire interface. Sensor & Control IP Subsystem optimized to process data from digital and analog sensors and offload host processors to enable more power-efficient processing of the sensor data is implemented using Synopsys’ 32-bit ARC EM processor. 32-bit ARC EM Processor with Safety Enhancement Package (SEP) and ARC EM Safety Island IP support ISO 26262 Functional Safety applications with integrated hardware safety features. Ethernet GMAC IP enables the host to communicate data using the Gigabit Ethernet protocol (IEEE 802.3) at 10M, 100M, and 1G speeds.